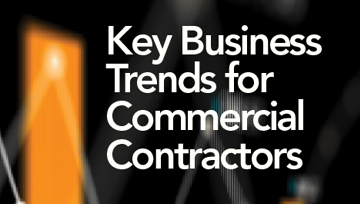 The Key Business Trends for Commercial Contractors Report analyzes the data from the 2017 and 2018 quarterly surveys of contractors conducted by Dodge Data & Analytics that form the basis of the USG Corporation + U.S. Chamber of Commerce Commercial Construction Index. Its highly graphical approach provides a succinct overview of the trends, drivers and concerns of hundreds of U.S. contractors. The report shows how backlog and confidence about new business have evolved in this period, along with revenue and profit margin expectations. It also looks at the challenge with workforce shortages, including the trades with the greatest shortages and how contractors are dealing with this issue. It demonstrates the emergence of concerns in 2018 about the cost and availability of products, materials and equipment.